My colleague (I’m trying out this new word, its fancy talk for “work friend”) and I were skimming the pages of the December issue of Glamour, one of my favorite women’s magazines because it’s full of shiny things as well as articles that tickle my noodle. Here’s the cover, with Michelle Obama wearing shiny things – fabulous editorial decision on their part to attract the “thinking women” and the “women who like shiny things.” Worked on us. 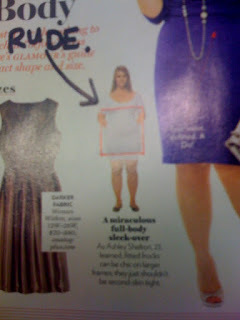 This is something about women’s magazines that has irked me for years but stirred the debate pot in the cubicle bay yesterday: What is up with the little stories that teach you how to dress for your body type? Every single label they give the body types is so freaking mean. 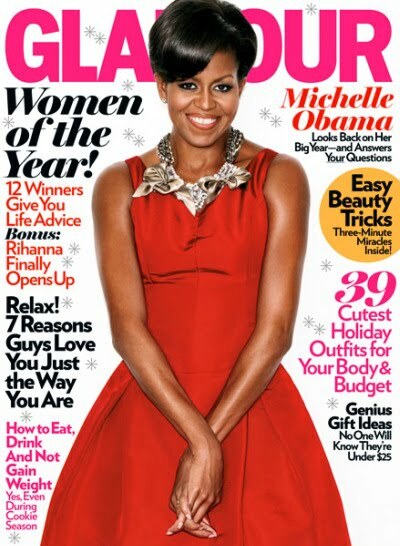 Why don't they tell us what type Michelle Obama is, or whatever flawless starlet is on the cover? They've gotta have their own body image demons. See the snapshot of the actual spread below (Yes, they’ve literally put a red box around her “problem area”). Boy Shaped – Curves, who needs ‘em? Admittedly, everyone who falls into these categories – which is every woman operating in the real world -- isn’t thrilled about their particular “problem area,” and the article has good intentions, but calling someone “Boy Shaped”, really? Isn’t that like the ultimate slam? As a sidenote, I fall into the “Pear Shaped” category and it infuriates me to no end. This “pear” label always seems to pop into my mind when I try on clothes that don’t quite look right. The pear really isn’t a silhouette I want to resemble. Damn you popular media. I wish I had the strength of mind to boycott you. But if I did, what would I think/blog about? You really need to call out the fact that this is a picture of a REAL person; she looks a bit cartoonish in the picture (thanks for nothing, iPhone). 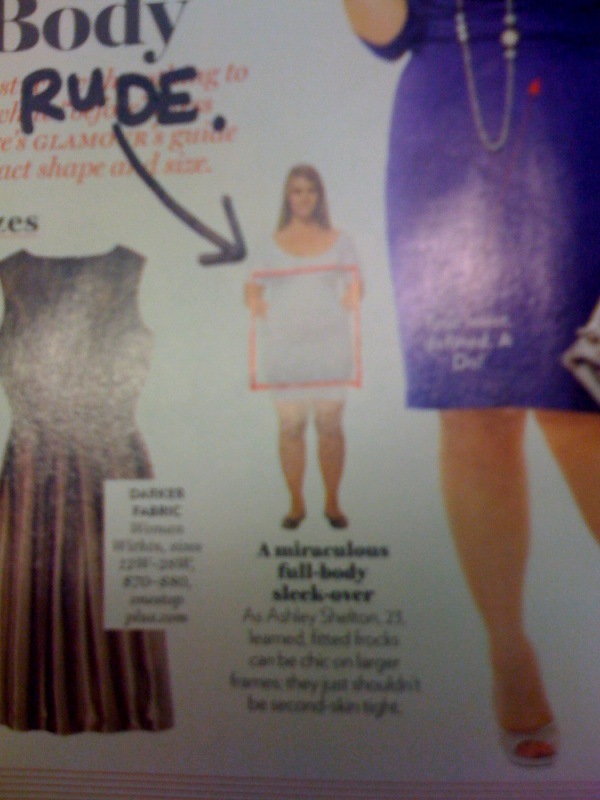 And yes, they DID put a garish red box around her whole body ... the only other bitchier thing that these magazine editors could have done was to buy this gal a whole mirror and said, "there's your problem area!" this whole topic gets me really fired up. I love this post. And the fact that you wrote "RUDE." on the magazine. I am a "Lots to love, and even more to offer" who is "hippy and fabulous" and a little "Boobilicious." Basically everything but boy shaped. hahaha.